On a November road trip around Nebraska last year, I was surprised at how much there was to see and do. Alas, it was spread out over lots of flat open space, but there were many road sections with 70-75 mph speed limits. That helped. I drove on the Cornhusker Highway for a bit just because I liked the name. The State Capitol has a large tower in the middle with interesting artwork, including floor mosaics of different dinosaurs. And I had come to Nebraska because of the dinosaur sites. 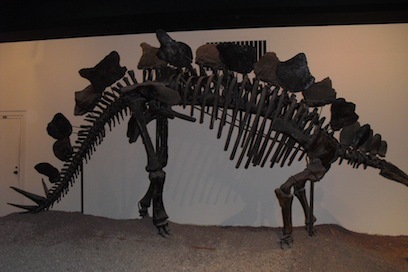 Morrill Hall in Lincoln displayed an excellent collection of dinosaur skeletons and the Jocelyn Art Museum in Omaha showed a large and outstanding collection of art. Still in Omaha, were two historic homes loaded with interesting trivia. Mr.Salisbury got rich on foundation make-up and filled his mansion with art that was truly something to see. Nearby in Council Bluffs, was the final home of Grenville Dodge. He was a Union general whose spy network contributed to the Union’s victory in the Civil War, and then he went on to build the Transcontinental Railroad in Nebraska and further west so he also made a lot of money. Both these millionaires led fascinating lives and it was good to see their stories being told. Omaha made an impression on me. It was there I stumbled upon the Apollon, in a historic neighborhood yet. That art community was hosting a fun & interactive dinner theater featuring Alfred Hitchcock. The courses to our meal were either mentioned or shown in his movies and you could get in a shower have someone else come at you with a rubber knife or you could sit under a low hanging mobile of black birds. An Alfred Hitchcock silhouette painting was expounded upon by the painter. Looking out the huge storefront window onto the sidewalk, we were all witness to what looked like a mysterious crime! What a treat. As I was craning my neck to check on my parked car, my table companion noted that the building across the street had housed an infamous brothel in the 1800s. 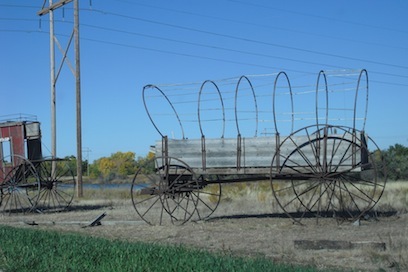 The Museum at the Great Platte River Road Archway had much interesting history: Pawnee scouts fought for the U.S. Calvary to defeat the efforts of the Cheyenne and Sioux to stop settler/railroad encroachment. Some contemporaries opined that without their help, the Government’s victory would not have been so swift. General Crook is credited with getting legal counsel for Standing Bear for a court proceeding where the judge found “Indians are human beings under the law.” Visitors could watch a digital reenactment of news transmission over a Pony Express route and hear the journaled comments about the covered wagon journeys undertaken by real people–some having little knowledge or experience to prepare themselves for the journey. I could relate to that.